Evidently the powers are be are willing to think and act out of the box. 90% tax passing in the House? Unheard of! Requiring the same WRONG credit rating agencies to rate the Government Bonds for the relief effort? Insane! So, if you all are willing to consider and do all these off the wall, and destructive things, let me suggest an off the wall, and may I say constructive solution. Can we put Paul Volcker in charge? No more advice. Put him in an "order giving" capacity. He has more common sense, experience and more focus on the big picture that the entire Fed and the entire Treasury put together. He's already done every thing. He understands Wall Street. He understands the power of the Fed (he was the Chairman of the Fed). Who else can get us out of this mess? Geithner has all Wall Street solutions. Hear the new one? Subsidizing the purchase of toxic assets. From the Wall Street Journal, Tim Geithner's Op Ed: My Plan for Bad Bank Assets. Hello - they are "toxic". More waste of taxpayers funds! Why can't we put Volcker in charge? I am now so thoroughly disappointed with Bernanke's confidence in the ratings agencies. After all those speeches about regulatory reform. Evidently, they are hollow. You cannot be serious about regulatory reform and have an iota of confidence in the ratings agencies. I am so thoroughly disappointed with Geithner's plan to allow the private sector to set the prices and then get huge subsidies to buy them - all with taxpayer's money. 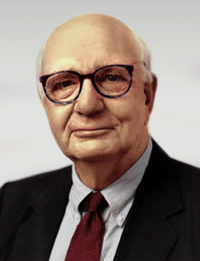 Can we put Volcker in charge of the Fed and the Treasury at the same time? Where are the constitutional lawyers? Watch Paul Volcker here - doesn't he give you confidence? He gives me confidence. At least I feel like he's telling the truth. And most importantly after today's testimony, I don't feel like he's being condescending. Roughing up from Congress comes with the territory, and without Congress there is no new law, so I'd really like it if Geithner and Bernanke would nicely answer some simple questions about how taxpayers money is being spent. That is Congress' job after all - the people sent them there and the people can make sure they do not go back.